I'm a Party Hopper — sarah lane. So here I am, stalking my old co-workers, and I come across this image on Luis Hurtado's website. As you can see, my former colleague Luis is a talented graphic artist (he's also a nice person, if you must know). However, I have no idea what this poster is for. 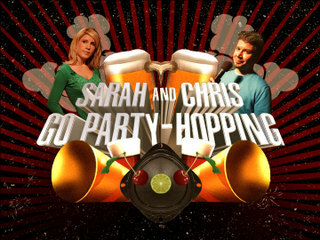 Did Chris Gore and I go party hopping together at some point? It must have been a great party, 'cause I gots no recollections. In fact, I probably owe Chris an apology. The mind often prefers to discard what the mind does not want to face, if you know what I mean. And by that, I mean that I like Red Bull/vodkas. Amazing what you can find out about yourself on the internet.